HomeUsing “health outcomes” as the basis for developing effective and sustainable hygiene interventions – is 2019 the time for a rethink? Using “health outcomes” as the basis for developing effective and sustainable hygiene interventions – is 2019 the time for a rethink? For many years, “5 log reduction” (LR) has been the gold standard for disinfectant efficacy despite absence of dose:response data linking it to clinical outcomes. The family of EN tests now used to support claims for disinfectant products has its origins in the European Suspension Test (5LR, 5 mins, 5 test organisms) where 5 LR was probably chosen because it is the limit of sensitivity in an assay where, traditionally, the initial bioburden is 108 colony forming units. For soap, detergent or dry wiping procedures, until recently their effectiveness has been assumed – possibly on the basis that they produce visible cleanliness? It is only recently that we have had access to efficacy data based on lab models. A trial of EN 1699 handwashing test showed a mean 2.76 LR when hands contaminated with E .coli are washed with soap. Fifty years on, we face new challenges – many related to sustainability of hygiene interventions. This includes conservation of water and energy, minimising environmental and safety issues, and mitigating adverse effects on microbial ecosystems, particularly reduced sensitivity to antibiotic treatment. Set against this, the expanding published database on initial bioburdens, survival, transfer and infectivity of pathogens together with development of Quantitative Microbial Risk Assessment (QMRA) provides opportunities to develop hygiene procedures based on predicted health outcomes, whilst also addressing sustainability issues. Faced with these challenges and opportunities, surely it’s time for a rethink? Nowhere is this more relevant than hygiene in home and everyday life (HEDL). Lack of intervention study data correlating hygiene with health outcomes means that advice tends to be based on expert opinion, extrapolated from other settings e.g from farm to fork or from healthcare in hospital to healthcare at home where risks are assumed to be lower. Countless times I have been told that, because infection risks at home are lower, disinfectants are not needed, hot soapy water is all you need and using antibacterials creates a false sense of security. The reality, if we look at the wealth of microbiological and clinical data now available on HEDL, is that infection risks are not necessarily less, just different. This blog reflects a consensus paper from a group of European and US experts, commissioned by the International Scientific Forum on Home Hygiene (IFH) , which calls for a more balanced approach where importance of effective hygiene is balanced against environmental, antimicrobial resistance, etc issues – and proposes a strategy to achieve this. This starts from the fundamental principle that hygiene procedures, regardless of whether they involve removal or inactivation, or are applied to hands, environmental surfaces or fabrics should reduce contamination to a safety target level considered “not harmful to health”. QMRA uses published data on likely initial bioburdens, together with transfer rates and infectious doses to estimate health outcomes and calculate the LR required to reduce infection risks to a safety target level appropriate to a given situation. A 2018 study by Reynolds et al illustrates how this works . This study used QMRA to quantify health outcome for rotavirus, rhinovirus and influenza A where a contaminated surface was touched with the fingers, and the fingers then touched the mouth, nose or eyes. They estimated that, for a single touch, an average, 4 LR was sufficient to achieve a 10-6 safety target level (i.e. a risk of infection less than 1 in 1 million) for rotavirus and rhinovirus, whilst influenza virus (which has a higher infectious dose) required a 1.23 LR or less. Under conditions which assumed 6 hours of contact activities, although 1.23 LR would reduced the infection risk for influenza A below 10-6, for rotavirus and rhinovirus a 5 log10 reduction was required. This shows how the infectious dose of pathogens significantly affects the choice of hygiene procedure, making viruses more challenging to deal with than bacteria with generally higher infectious doses. QMRA allows LR specifications to be adjusted for heavier surface bioburden (e.g. following handling and preparation of meat or poultry) compared with ambient levels. Choosing hygiene procedures for HEDL settings has traditionally been based on the choice between removal of contamination (by dry or wet cleaning), or cleaning followed by disinfection (or hand sanitization). Given the need to also address sustainability issues, we question whether this approach is appropriate. Hygiene in HEDL starts from the inevitability that reducing contamination on hands, surfaces and fabrics requires use of one or more resources: water, heat, mechanical action, detergent, or microbiocides. Since all of these consume either water or energy, or have potential environmental and other impacts, the question is “how to combine them in the most sustainable manner to produce the required safety target level as determined through QMRA?”. The figure lays out a hypothetical framework showing how this might work and is further described in other publications . The values are largely hypothetical, because requisite data is unavailable. This approach recognises that, in practice, there is no clear dividing line between what is, or is not, microbiocidal since soap, and detergents contribute some microbiocidal action to hygiene efficacy, as do bleaching agents added to enhance their ability to produce cleanliness. In most situations, as shown in (a), 3LR produced by handwashing with soap followed by through rinsing is currently considered sufficient to reduce contamination to a safe level, but in situations (e.g care of those at increased risk of infection, or dealing with low infectious dose viruses) handwashing with soap followed by use of alcohol hand sanitizer may be required. For environmental surfaces (b) 3LR produced by detergent-based cleaning followed by rinsing may also be considered sufficient for most situations. However, for surfaces cleaned without rinsing (c), although this may be sufficient for low risk floors and furniture, for high frequency touch surfaces (many of which cannot be rinsed) such as food preparation surfaces, toilet seats and flush handles, door handles, etc, additional use of disinfectant giving additional LR may be needed to achieve the safety target level. It is often said that surfaces must be cleaned before disinfection but, by taking account of LR achieved by the cleaning procedure, this could mean that only low level microbiocidal action is required. This approach is being developed for low temperature domestic laundering of clothing and household linens . Low temperature laundering is accompanied by significant reduction in hygiene efficacy, but this can be compensated by using detergents containing active oxygen bleach (which delivers low level microbiocidal action sufficient to compensate for lack of heat inactivation (d) and (e), or longer cycles times to increase microbe detachment from fabrics. Of course this approach is only as good as the available data, but arguably, even based on currently available data, it provides a more rational science-based approach – particularly when compared with the 5 LR gold standard approach? Containing the burden of infectious diseases is everyone’s responsibility: a call for an integrated strategy for developing and promoting hygiene behaviour change in home and everyday life. Wilson AM, Reynolds KA, Sexton JD, Canales RA. Modelling surface disinfection needs to meet microbial risk reduction targets. Appl. Environ. Microbiol.. 2018 Sep 15;84(18):e00709-18. Bloomfield SF, Carling PC, Exner M. A unified framework for developing effective hygiene procedures for hands, environmental surfaces and laundry in healthcare, domestic, food handling and other settings. GMS Hyg Infect Control. 2017;12:Doc08. DOI: 10.3205/dgkh000293, URN: urn:nbn:de:0183-dgkh0002937. Bloomfield SF. Developing an Evidence-Based Approach to Domestic Hygiene Which Protects Against Infection Whilst Also Addressing Sustainability Issues, Tenside Surf. Det.55(5) (2018) 356-363. DOI 10.3139/113.110576. Brands B, Brinkmann A, Bloomfield SF, Bockmühl DP. 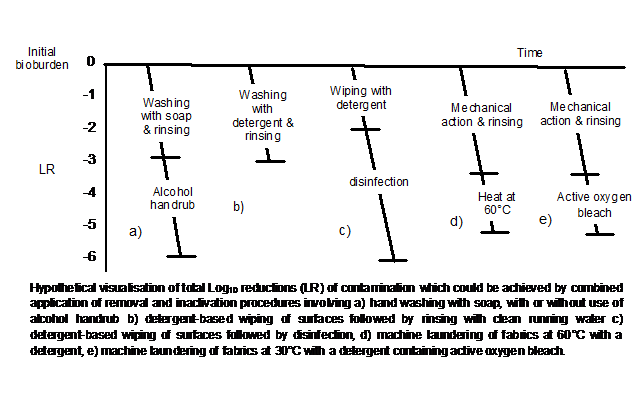 Microbicidal action of heat, detergents and active oxygen bleach as components of laundry hygiene. Tenside Surf. Det. 2016;53:495-501. – Somewhere this approach needs to account for microbial susceptibility to disinfection, or you need a separate model for each organism because they’ll respond differently to disinfection. – This seems ripe for a mathematical modelling approach, especially when evaluating optimal use of resources (i.e. water, heat, mechanical action, detergent, or microbiocides).